Here are some charts and figures from our Vantage Pro2 weather station summarising 2013 weather in Reigate. All data is posted on our data page for you to download freely and use, but please credit RGSweather for any subsequently produced materials. Excel pivot tables have been used to generate some of the more fun charts and statistics below. Reigate topped the charts for recording the highest temperature in the UK at times during 2013 summer. Lowest Tmin -5.9C on 22 January at 3:37am. Lowest wind chill -11.9C on 12 March at 5:03am. The chart below shows daily average temperatures in Reigate throughout 2013 as a full circle. Note the annual average temperature for Reigate (10c) is shown as a red circle. Despite recent experiences, it doesn’t usually rain that much in Reigate compared to elsewhere in the UK. The extraordinary rainfall of 23-24 Dec recorded a rare 70mm for that period on our manual rain gauge. The graph shows that this rainfall total is unsual for Reigate. The wettest day of the week, overall, in 2013 was… Friday (but not significantly) with Thursday being a significant driest day. Highest rainfall intensity 182mm/hr (briefly!) on 22 November at 8.38am. wettest day of the week = Friday! The strongest gust recorded in 2013 was 48mph, more exposed hills and places locally recorded 60-70mph (e.g. Redhill aerodrome). Reigate is sheltered from Northerly winds by Reigate Hill and from more common gales from the South or SW by high ground at Priory Park and woodlands. The windiest months were October and December in respect of highest maximum wind gusts measured. Wind run is a measurement of how much wind has passed a given point over a period of time. A wind blowing at three miles per hour for an entire hour would give a wind run of three miles. Wind run is a measure of the persistence and duration of a particular wind direction. The longest wind runs for Reigate in 2013 were associated with NE winds in March, which were persistent. The fateful Channel Blizzard wind run that met warm SW winds and caused such unusual snowfall in the Channel Islands recorded the longest wind run of 267 miles. It’s interesting to note that our most common westerly and SW winds achieve relatively short wind runs, this is probably because our prevailing winds are associated with LOW pressure systems that cause rapid changes in wind direction as they pass through. Spring 2013: remember the cold wind chill? Most of the heaviest rainfall totals for Reigate in 2013 arrived on South (S) and West-South-West (WSW) winds. The wind direction bringing highest average rainfall intensity (rainfall rate mm/hr) in 2013 was SSW. There looks to be a strong correlation between rainfall rate and wind speed. The chart shows that the heaviest rain tends to occur at lower wind speeds. The strongest gales it seems often just precede, or arrive soon after, warm or cold fronts, prior to arrival of or just after the heaviest rain has passed. This was certainly the case in the October StJude storm when the, now infamous, stingjet winds followed after the heaviest rain on the cold front had well and truly passed through Reigate. In conclusion: Reigate, Surrey has the best weather in the UK, probably! It is one of the driest, least windy, least stormy (we get few thunderstorms compared with many places) and sunniest and warmest places in the country. Reigate was one of the warmest or nearly-warmest places in the UK a number of times in 2013.
sheltered from S and SW gales by Priory hill and woods. low altitude: 100m above sea level: not exposed. on the lowland East of the UK: enjoying a regionally sheltered location from cold easterly winds (Kent gets these) and westerly gales and heavy rainfall. 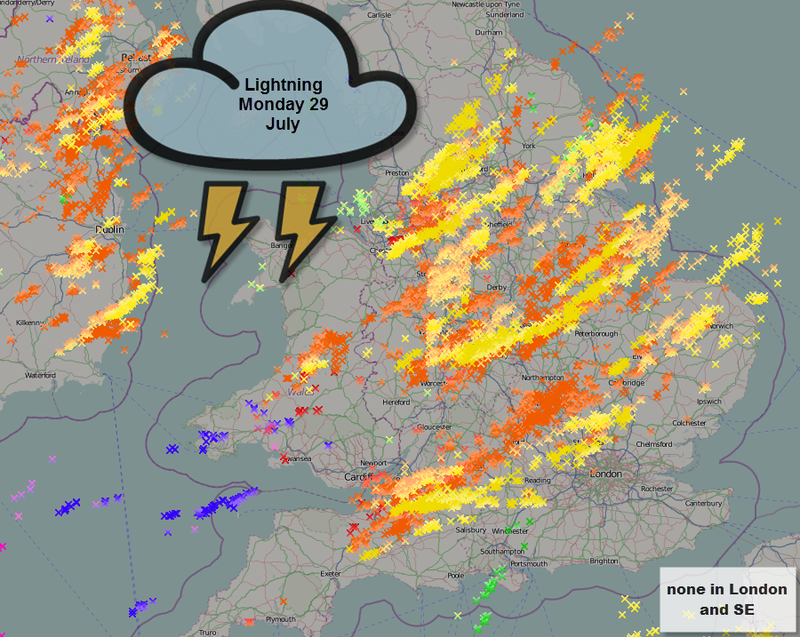 in a location that usually avoids extreme convective thundery activity (2013): Reigate missed several thunderstorm events that passed to the north of London from a SW direction; this may or may not be usual. Calibrate the tipping bucket VP2 rain gauge before Easter. Further outreach to other schools and interested parties regarding all-things weather, via this blog and @RGSweather. Expand the school club and further engage students in the wonders of weather. Expand the use of data in school to include more departments. Provide a local service to help forecast and understand extreme weather, when we can, via Twitter. Encourage readers to post comments and together contribute to the wider understanding of weather locally. A sincere thank you to all readers for making this such a success in 2013 and please come back for more in 2014!